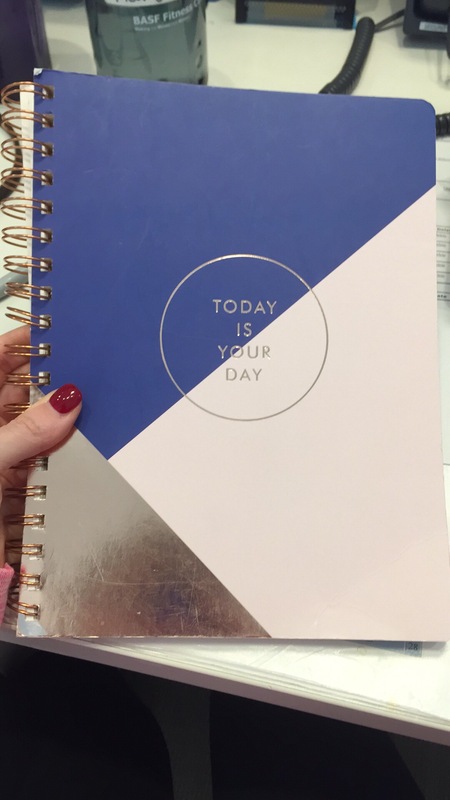 Notebook that kept me inspired all weekend. 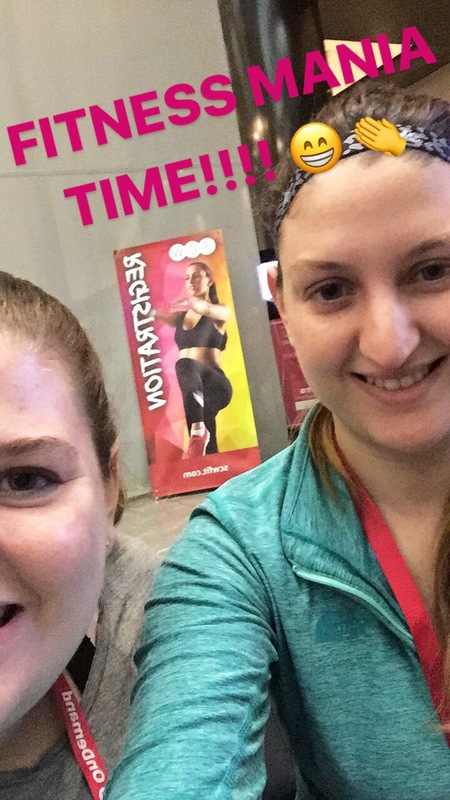 This was my first Fitness Convention of any sort, so I was really excited about it but also had no idea what to expect! I’m still fairly new to the Group Ex and Personal Training world- I got certified in 2015/2016. It was funny listening to men and women joke up how much the world of group exercise has changed since the 80’s, always making comments like, “yeah, you ladies remember how it was!” I was very much aware just how young and new to the industry I was. But anyway, let’s talk more about this convention specifically. The location was really easy to get to for us. We just hopped on a train to NY Penn Station and enjoyed our walk through NYC to the Grand Hyatt. Now the hotel, on the other hand, was just…meh. I was not impressed. There were a lot of things broken or not working well (including our toilet in our room). But what can you do! Welcome Bag: We got a neat little welcome bag that became super helpful to carry our stuff all weekend! We actually thought ahead and packed drawstring bags so we could carry our water, phones, snacks, etc. from room to room but this worked even better! Not to mention, they were stuffed with fun little snacks as you can see in the photo below. Ashley and I were super excited and had no idea what was coming to us hahaha… what had we gotten ourselves into!? Our first class was Pound Fitness! OMG can you talk about an exciting, energizing, heart pounding workout?! They give you two neon green fitness drumsticks and tell you to just pound AS HARD AS YOU CAN! The music choices were AMAZING. Some of the artists that can be heard in a Pound Workout include Paramore, Good Charlotte, System of a Down and of course, many new mainstream pop songs! But I’m all about the throwback pop punk songs! When Crush Crush Crush by Paramore came on, I went wild — I was so into it that I didn’t realize how much of a bicep workout I got until I was wincing after class hahah. I would highly recommend trying it! 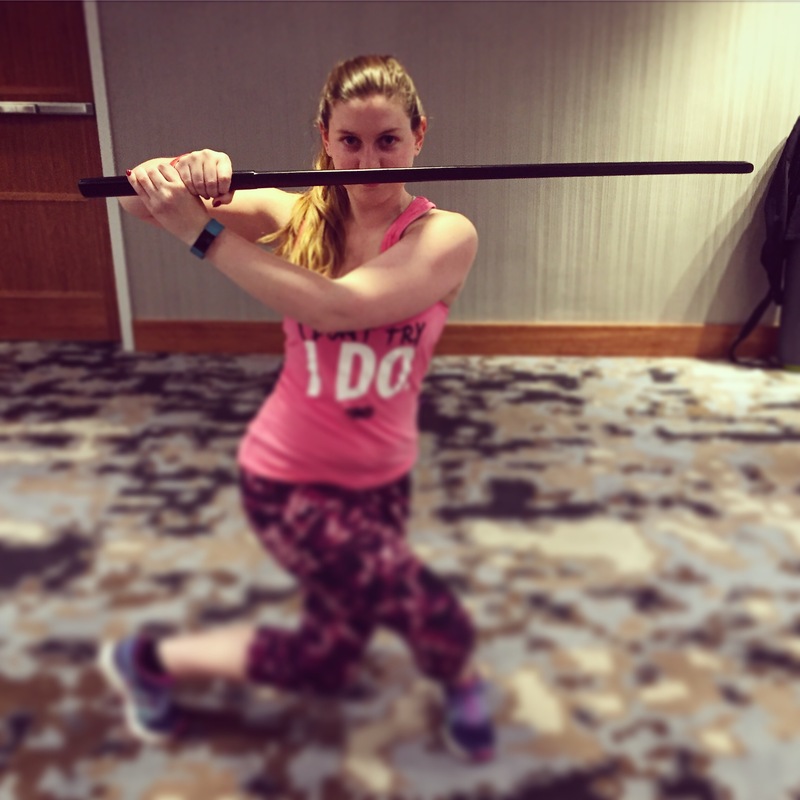 Our instructor, Danielle (@fitwithd on instagram- check her out!) was amazing and so high energy! 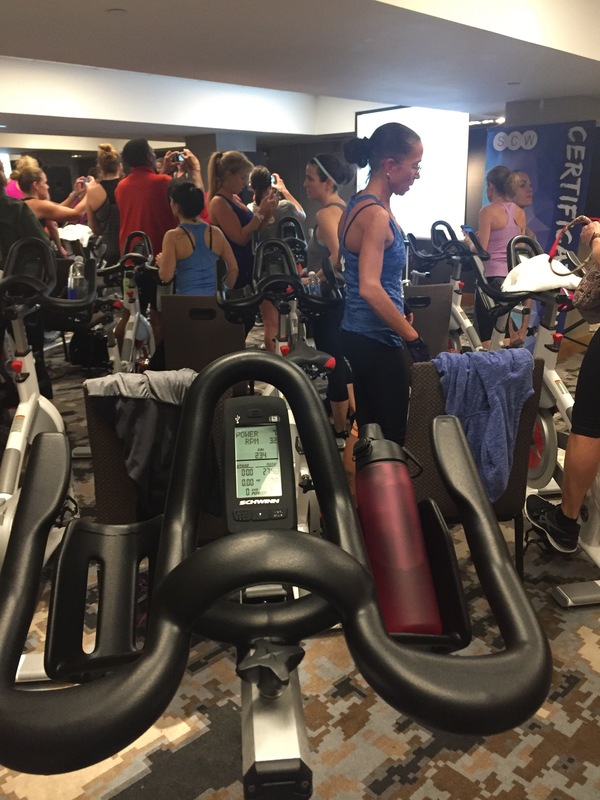 I also tried a cycling class. It was half lecture about how to make your cycling class great and half was an actual 30 minute ride. The presentors/instructors were really good, and I knew they were good at what they did, and they got the class excited, but I still just cannot get into spin! I’m sorry to all the spin enthusiasts out there. I’m glad people are into it! But even after trying to get into it, it’s just not my thing. Thanks for the great workout, though! We definitely didn’t really plan our eating very well this weekend. We packed a handful of Kind bars, Lara bars, Shakeology packets, and a banana and an apple. We figured we would wing it from there. Everything in the hotel was really expenisive (duh). They had a market, where we bought the food shown below Friday night for dinner when we realized we were STARVING after so much activity. We got two things of sushi, a coconut water and a chocolate bar for $40. I packed the tea bags, so we got some free hot water and had some nice Mint Medley tea before bed. 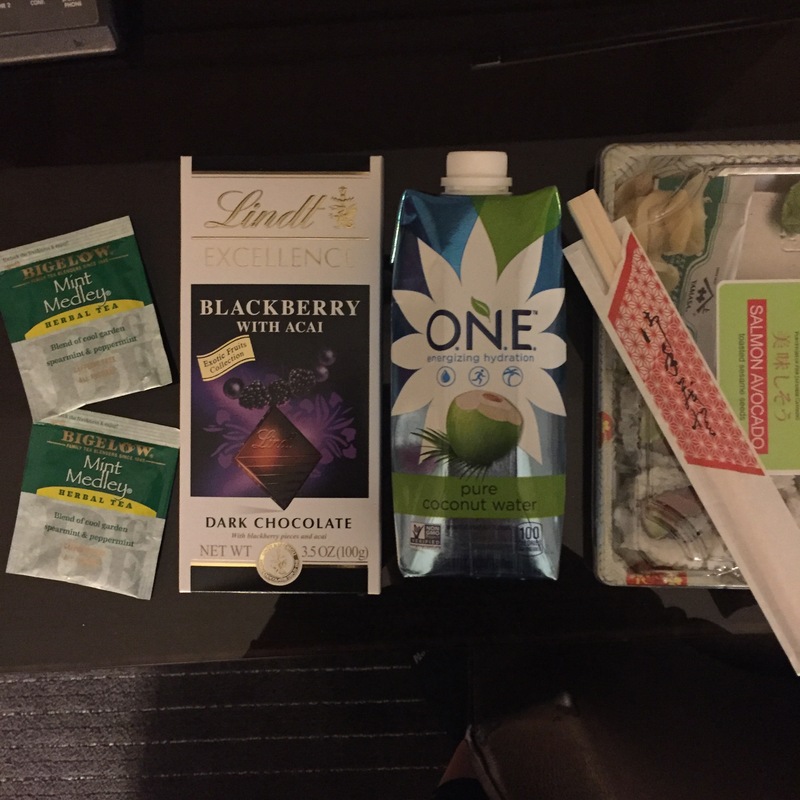 I think the first day, I ate a Lara bar in between sessions, an apple in between sessions, the kale chips they gave us, the peanut bar they gave us… and then the sushi and a piece of dark chocolate. The next day I had a Kind Bar, one of my Shakeology packets, more chocolate, a banana I think, and then we decided to explore NYC and get some dinner outside of the hotel. We found an Irish pub that was delicious, and we feasted on some Shepard’s Pie and Bangers and Mash…mmmm! 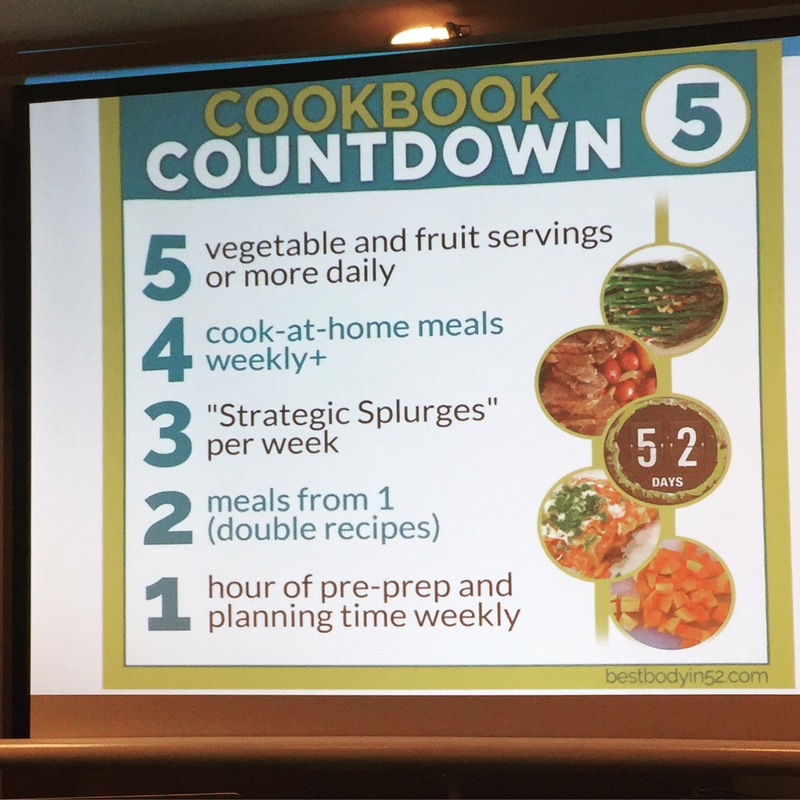 There were a lot of great lectures and presenters, so it wasn’t all just workouts, workouts, workouts. And of course, you pick and choose your schedule – so you can pick more lectures than workouts or visa versa. We loved the nutrtion ones by Sohailla Digbsy. She was amazing and so down to earth. She has this great book and program, called Best Body in 52. I would definitely recommend checking it out if you get the chance. This countdown is part of it! 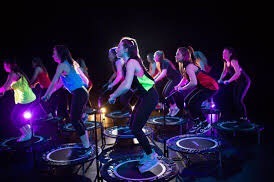 We missed out on our chance to try Boogie Bounce but it looked like a lot of fun! It’s like a dance party on trampolines – how could it not be fun?! Defintely the highlight of the weekend was my experience with JUNGSHIN FITNESS. We took a class on Saturday, and we loved it so much we actually switched into the Sunday one (sorry boring lecture on “what’s your next move?”). Something clicked in me and I connected with this so much, I wanted to get more involved. I wanted to see where I could take classes back home and practice more. That’s when I found out – this is still so new, and it’s California based, that’s there’s no instructors in New Jersey! There’s only one studio in NYC that offers it. So you know what I did? I decided hey- why don’t I become that instructor in New Jersey?! I can bring this amazing, inspiring, rejuvinating workout to NJ and show everyone what it’s all about! So I did. My Instructor Training is on April 23rd. And I’m SO EXCITED!! You should check it out – http://www.jungshinfitness.com — It’s so much fun and you get to feel like a super ninja warrior! Who wouldn’t want to do that?! If you’re looking into going to one of the SCW Mania Fitness Conventions, or even another one, comment below or message me! I’d love to answer any questions you may have or concerns. Or, if you have attended one, what did you think?! 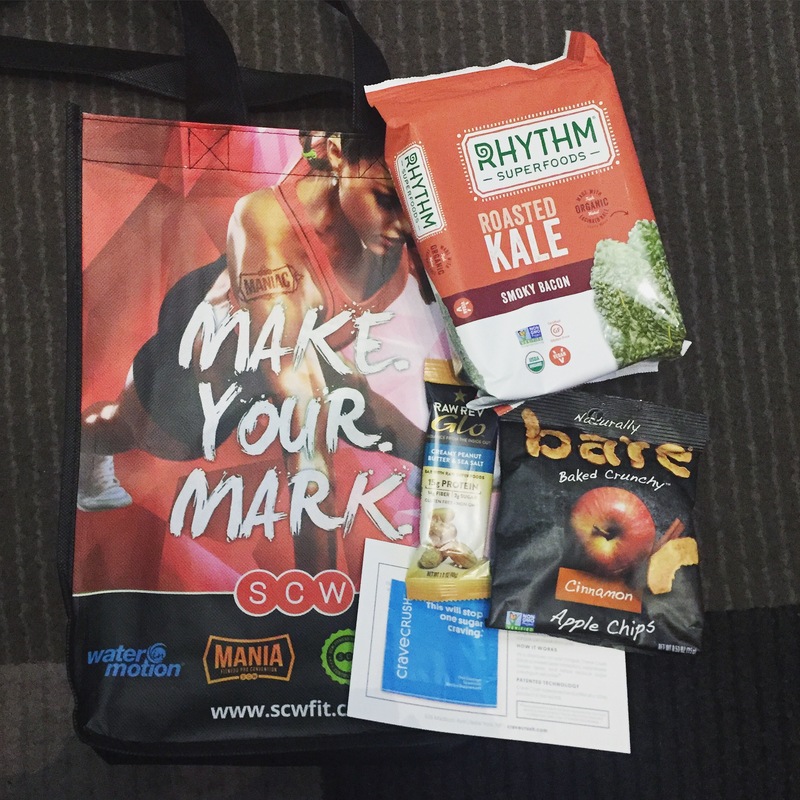 Coming Up: SCW Fitness Mania in NYC!